Nine hours ago the fourth Tachikawa Vanguard Championship closed with a Nova Grappler cardfighter playing the new Raizer Legion deck in first place, followed closely by a Royal Paladin fighter in second running a Cosmo Dragon deck that synthesized three-year-old Soul Saver Dragon support with BT16: Legion of Dragons and Blades' recently-released Seeker units. Third and fourth were likewise filled by Thing Saver and Raizer fighters. Both Nova Grappler and Royal Paladin have enjoyed considerable popularity among professional cardfighters since the set's release day, gaining favor for their aggressive self-standing vanguards whose speed--able to bring out their skills as early as turn 3--has supplanted the formerly dominant Nouvelle Vague deck, a deck once feared as having potentially solved competitive play. Out of the Tachikawa VGCS' 96-person turnout, not a single person ran Dragonic Nouvelle Vague. According to tournament organizer Kohaku, the top 16 for the tournament consisted of five Seeker decks, five Raizers, two Spike Brothers, two Musketeers and two Metalborg decks. Although written deck recipes are not yet published, the top 2 decklists from the VGCS were photographed and uploaded to Twitter, and have been transcribed below. The first place deck was a streamlined version of Beast Deity Cup champion Silver Crow's Raizer build, running just four grade 3s to accommodate a Cat Butler playset, and focusing on setting up Legion quickly with Shieldraizer and Energy Charger while building card advantage using Street Bouncer. Second place cardfighter Yukiya's Cosmo Dragon deck brought some much-needed innovation to the emergent format, running five grade 3s with a single copy of Soul Saver Dragon made searchable using the time-tested grade 1 Pongal. Yukiya's alternate artwork Soul Saver (illust. Studio TMS) served as a finishing move after several bouts of Thing Saver Dragon's restanding skill, taking advantage of the deck's strong soulcharging engine using multiple copies of File, the draw trigger Margal and Legion's special property of sending the entire Legion pair to the soul when another grade 3 is ridden. 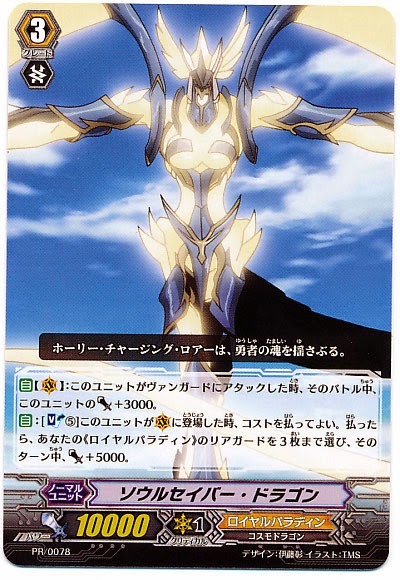 Soul Saver Dragon's on-ride soulblast 5 is well remembered for being one of the first mass field power boosts in the history of the game, but is rarely played today due to contemporary cards often gaining comparable levels of power with minimal setup. Soul Saver also served an alternate purpose in facilitating the same kind of minimal grade 3 count as is played in Raizers, and due to the nature of her support is flexible enough to work either as a strategy in her own right or purely as a setup for Thing Saver Dragon to build more soul for his Soulmate Legion skill. 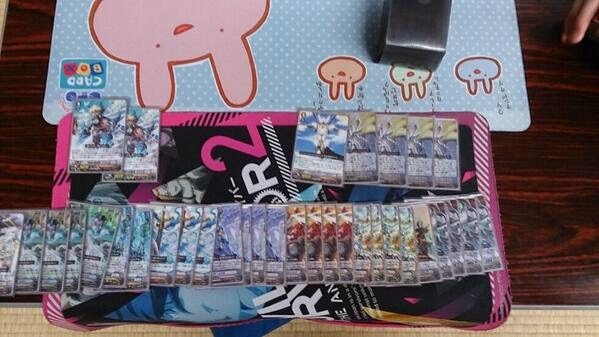 Yukiya tweeted that the trigger count for the deck was 8-4-4, presumed to be eight critical triggers, four draw triggers and four heal triggers based on the general trends within Japanese play. The fourth Tachikawa VGCS results were mirrored at the Fighter's Road 2014 Sapporo regional qualifier, where first place was taken by a Thing Saver Dragon cardfighter who was reportedly using a more normalized deck, followed in second by another Raizer fighter picking up on recent trends. 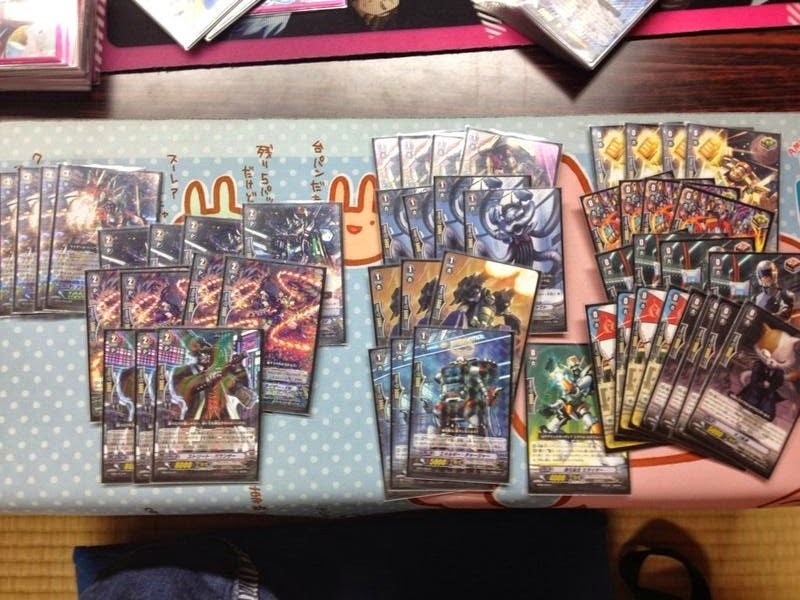 Decklists for FR2014 Sapporo are expected to go out in the next few days. The VGCS tournaments are a series of unofficial tournaments organized by fans and cardshops. Unlike Bushiroad's larger official tournaments, most VGCS events are done using a best of 3, Swiss tournament model. Turnout is typically 70-80 persons, but some events see 100 or more participants, all of whom compete using pseudonyms and internet handles rather than their real names as in official events. The VGCS model of fan-organized play has begun to gain popularity internationally, with the bi-monthly BeNeLux tournaments serving as their European equivalent.